The amount of 0.4 USD has been deposited to your account. Accounts: U2836474->U2555258. Memo: API Payment. 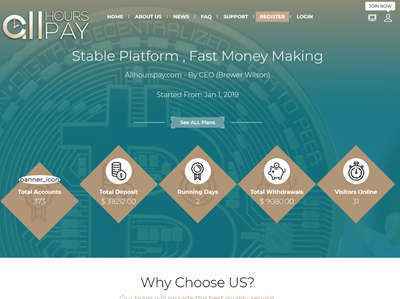 Withdraw to hyipbatalyon from allhourspay.com.. Date: 14:25 08.01.19. Batch: 242076175. The amount of 0.2 USD has been deposited to your account. Accounts: U2836474->U4480418. Memo: API Payment. Withdraw to hyiptrusted from allhourspay.com.. Date: 15:52 09.01.19. Batch: 242200484. The amount of 0.1 USD has been deposited to your account. Accounts: U2836474->U4480418. Memo: API Payment. Withdraw to hyiptrusted from allhourspay.com.. Date: 16:20 07.01.19. Batch: 241978978. The amount of 0.3 USD has been deposited to your account. Accounts: U2836474->U8678486. Memo: API Payment. Withdraw to shyips from allhourspay Date: 15:41 09.01.19. Batch: 242199093. The amount of 0.1 USD has been deposited to your account. Accounts: U2836474->U4480418. Memo: API Payment. Withdraw to hyiptrusted from allhourspay.com.. Date: 16:34 10.01.19. Batch: 242315931.